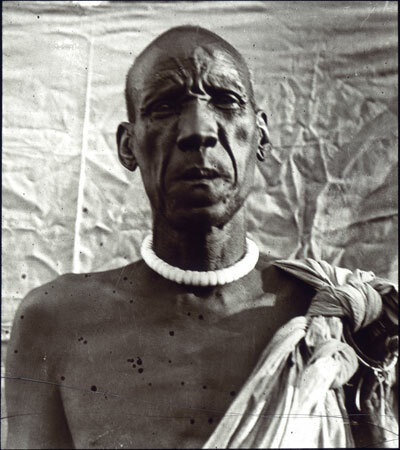 A head-and-shoulders full face portrait of a Shilluk chief photographed against a sheet backdrop, one of many physical anthropology images taken by the Seligmans. This Chief was probably photographed during the Seligman's enquiries at Kodok and Fashoda in late 1909. Manual catalogue entry (thermofax catalogue copy in folder '27-06 Seligman Slide Collection') - "V.b.26. Shilluk, aristocratic type. (225 and 226)"
Note on lantern slide - "V.b.26. Sudan. Shilluk Aristocratic type. CGS. 225"
Morton, Chris. "Shilluk chief" Southern Sudan Project (in development). 03 Jan. 2006. Pitt Rivers Museum. <http://southernsudan.prm.ox.ac.uk/details/1967.26.45/>.